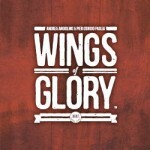 The Wings of Glory Miniature Game – Giants of the Sky project on Kickstarter entered its final week with over 500 backers and more than $85,000 pledged – 425% funded. New add-ons: Snoopy The Flyiing Ace kit and combo with the Sopwith Camel. In this final week, two special add-ons were announced: Snoopy the Flying Ace – a kit, produced by Running Press Book Publishers – which commemorates Snoopy in his iconic role as the Flying Ace, the daring World War I fighter pilot who sits atop his Sopwith Camel (i.e. doghouse), ever determined to take down his arch nemesis, the Red Baron. 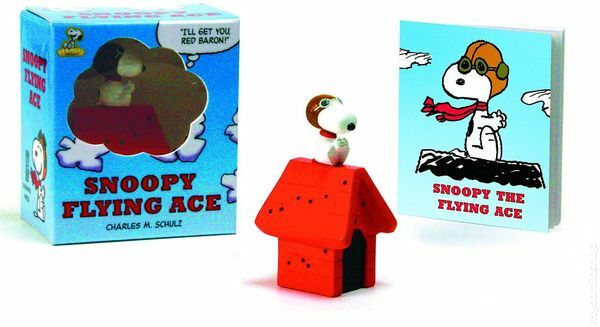 This kit includes a figurine of Snoopy as the Flying Ace in fight mode and a 32-page book of "Flying Ace"-themed Peanuts comics, for $10. There’s also the option of a combo with Snoopy and a Wings of Glory Sopwith Camel model, for $20. Since the launch of the campaign, four stretch goals were unlocked, adding poster maps to use together with the bomber models as gaming mats, a cardboard management card, a package of 5 scenarios (3 to be included in the O/400s and 2 to be included in the R.VI) and the WW1 version of the Wings of Glory Toolkit app for Android and IOS. The next stretch goal to be achieved is $95,000 - a set of three Ace cards and their specific skills, for a total of 12 different aces, to be included with each bomber. 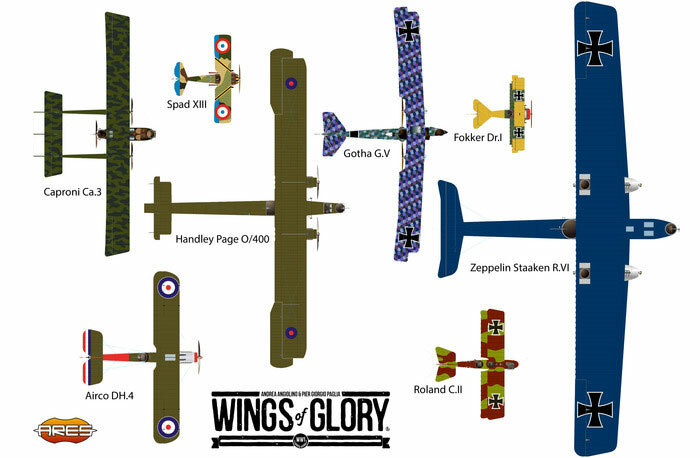 "Social" stretch goal: poster with all WW1 Wings of Glory airplanes. 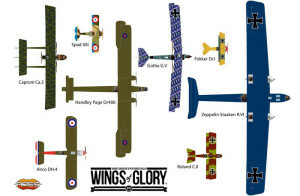 A “social” stretch goal was also announced: a beautiful poster with all WW1 Wings of Glory airplanes will become a part of the rewards of all backers Veteran and up (or any Rookie with one or more add-ons) by reaching 1600 fans on Wings of Glory Miniature Game page on Facebook and 300 fans on the WW1 Wings of Glory Rules & Accessories Pack page on Boardgamegeek. The Giants of the Sky project will run until April 2nd. Visit it on Kickstarter to get more information and to pledge.